Memorial Reference: Panel 25 to 27. ( Insrcibed as King-Stevens on the Banstead War memorial.). Sherwood Foresters (Notts and Derby Regiment) 8th Bn. Son of Robilliard and Frances Annette King-Stephens, of Teddington, Middx. Grave Reference: IV. E. 2. WARLINCOURT HALTE BRITISH CEMETERY, SAULTY Pas de Calais, France. Royal Marine Artillery Anti-Aircraft Bde. 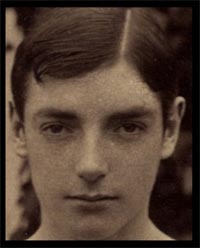 Son of Mr. Charles Stafford Knight of 68/70, Fenchurch St., London.and Mrs Lyllie Knight (nee Rowe) born in India in about 1871. Their marriage was registered in the third quarter of 1890 at Marylebone. 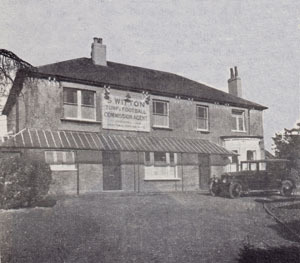 In 1911 they were recorded as living at Wingfield House, High Street Banstead and Mr Knight worked as a Lloyd's underwriter and insurance broker. 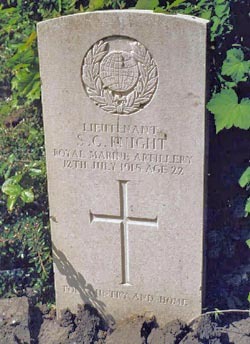 Stanley Knight born in Narzeing Essex was 18 years old at the time and an Insurance Clerk. Stanley had an older brother, Raymond born in Stamford Hill Essex who also worked as an Insurance clerk.Two more much younger siblings were born at Wingfield House, Hugh aged four and Kathleen aged three in 1911. The Knights were at Wingfield house for at least eleven years as there are two entries in the phone book for Charles S Knight Wingfield House, in 1915 the phone number was Burgh Heath 155 and in 1922 it was Burgh Heath 382. It seems that, having mobilised to Belgium with the unit that Stanley Knight was serving in, Herbert Asquith (one of the then Prime Minister’s 4 sons) became good friends with Stanley Knight. He mentions serving the guns with Stanley in the area of Nieuport, and mentions that Stanley was injured by enemy counter battery artillery fire & subsequently died of his wounds. The following extract is taken from "Gunner Officer on the Western Front: The Story of a Prime Minister’s Son at War " by Herbert Asquith. “Barr had moved our guns, but about the middle of June our new position was discovered. A battery of German field guns opened a heavy fire on us, and their aim was accurate. Their shells bracketed us very quickly, and some of them burst very close. It was Barr's custom on these occasions to order the men to take cover and the officers to man the guns: he had a gallant and merry spirit and I think he enjoyed firing them himself. As Knight and I were running to man No. 1 gun, a shell burst near me and I was hit in the mouth by a small splinter. My injury was slight, but it needed attention, and as my leave was nearly due, Barr suggested that I should have it treated in London. After a few weeks of treatment in England I returned to the front, and on arriving at Nieuport I heard that our guns had again been bombarded and that my friend Knight had been hit, and had died of his wounds. He was one of many thousands who had already so fallen, scarcely more than a boy in years, but bearing the fullest burden of a man. I had seen little of him at home, and our friendship had been formed, and suddenly ended, in the queer, unearthly conditions of that strangely twisted world, the line in Flanders; within it he stood forth as a splendid example of boyhood tempered beyond its years by stark experience, now and then impetuous, but a first-rate officer, full of care for his men, gay, gallant, and loved by all." Whilst not named in the preceding pages, the experiences of training & deployment described by Herbert Asquith in the book will be extremely proximate to those that Stanley Knight experienced. 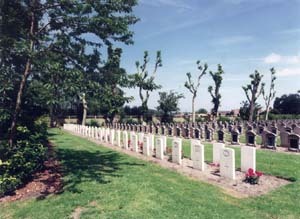 ADINKERKE CHURCHYARD EXTENSION De Panne West-Vlaanderen, Belgium. Portrait by permission of Felsted School.